Way back in 1993, T. Sampath Kumar, a qualified chartered accountant started a venture to make prawn seeds. Intrigued, how the marine food chain developed and helped the growth of the fishes in the oceans he identified and cultivated diatoms—a major group of algae which are among the most common types of phytoplankton that provide more than 50% of the marine food chain. Over the next 12 years he relentlessly pursued research on diatoms and finally discovered that the algae produced vast amount of pure oxygen underwater by the process of photosynthesis. Growing diatom algae in water in large quantities is a difficult proposition. That’s what Nualgi does. Developed by Sampath, Nualgi can grow diatom algae on almost any water substrate be it the sea, high saline water, fresh water, sewage water, effluent water etc. In 2005, Kumar founded Nualgi Nanobiotech, a Bangalore-based company to manufacture nanotech products for growing diatoms for aquaculture. Nualgi contains trace, special and appropriate nutrients that can deliver in a biologically available form. Upon application to the water body in the presence of macro nutrients, like N, P, K and sunlight, phytoplankton predominately in the form of diatoms, bloom and is soon converted to live food like zooplankton, a source of nutrition to fishes and prawns. What does ‘Nualgi’ stand for? Does the name have any significance? When we started with the development of the marine food chain we started growth of a new type of algae, called Diatoms. This was a new type of algae. Hence we coined the term Nualgi. It is just a coined term. 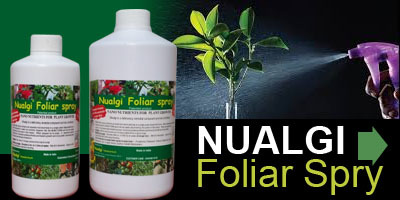 How does Nualgi foliar spray work? What’s the science behind it? Nualgi foliar spray delivers about 12 nutrients loaded on silica in the nano form directly to the chlorophyll of a leaf through the stomata. This package of nutrients helps boost the photosynthesis of a plant. Plants absorb more CO2 and make a liquid carbon pathway that is excreted through the roots to the soil as Oozuates. This helps soil microorganisms grow. They symbiotically deliver all nutrients from the soil and fix nitrogen from the air. This process is termed as Biomining. Instead of nutrients being made in factories outside, the soil microbes are the factories in the soil that deliver all nutrients to the plants. In what crops has Nualgi been tried and do tell us about the responses from the farmers. We have tested in all cereals, vegetables, tea, coffee, pepper, cardamom, oil seeds and horticulture crops. In fact, almost all type of crops. The results are very good with yields increasing by 20% to 100%, reduction of time of growth by 20% and better quality of crops. There are plenty of farmers in Hasan and Ramnagara districts of Karnataka who can vouch for our method. When should the Nualgi foliar spray be used and how many times in a fruit/ vegetable crops? For field crops 3 to 4 times spraying in the early morning on both sides of the leaves is recommended. For vegetables spraying time is reduced to 8-15 days. For horticulture crops we recommend 4to 5 times a year. How does Nualgi impact the soil? The liquid carbon pathway developed by using Nualgi helps soil regain their carbon contents. This helps in soil microbial growth and fertility. If no chemicals and fertilizers are added, the soil becomes more and more productive and fertile. Do you see a future when farmers will stop using chemical fertilisers and pesticides all together? Nualgi farming is economical and gives high yields. Farmers would definitely adopt this and stop using chemical fertilizers. Our process improves profitability of farming. The environment is saved too. As the benefits are established, even the governments will have to relook its fertiliser policy. Nualgi is a far superior and cheaper method to do farming as compared to other methods. We do not have any objections to people using other methods also in conjunction with ours. Progressively farmers will realize that our method is far more efficient, yields higher quality of crops at a very nominal cost and without altering the soil biology. Charles Darwin in his book The Formation of Vegetable Mould, through the Action of Worms, with Observations on Their Habits gave the world its first understanding of the fundamental role of earthworms as geologic agents for the transport of soil- a picture of surface rocks being gradully covered by fine soil brought up from below by the worms, in annual amounts running to many tons to the acre in most favourable areas. Darwin’s calculations showed that the toil of earthworms might add a layer of soil an inch to an inch and half thick in a ten-year period. Ever since then farmers world over have domesticated the earthworms-using the crawlies to make vermicompost and reducing their dependence on chemical fertilisers. Congrats to the tribe for it shows they care for the earth. Soon I too will join the tribe. My compost pit, made of Cuddapah stone slabs, is ready and waiting for its would-be residents. I have made elaborate plans. Beside plant materials I’m going too add crushed eggshells, dust collected from flour mills and tap water (for moisture). I’m told that it takes nearly three months for the vermicompost to be ready. I raise a toast to Charles Darwin. On my way to my farm I regularly come cross an Emu farm and have always wanted to visit it out of curiosity. But haven’t done it so far because I’m always in a hurry. Either to reach the farm, having kept away for over a week, and on my way back home not wasting a minute so that I can catch the next local. Having read a report on the benefit of using chicken poo, I intend to visit the farm and shake hands with the Emus! Meanwhile, I have asked my village friends to check out poultry farms in our neighbourhood and their willingness to sell poultry manure. Because floriculture and horticultural crops respond well to poultry manure. Crops absorb the nitrogen in poultry manure similar to urea. So they need lower doses and proper irrigation. Poultry manure is a more concentrated source of crop nutrients, especially NPK and calcium. Being naturally organic, it does not need composting and can be applied directly to the fields from the farm, said Prof. D. Narahari, former Head, Poultry Science, Tamil Nadu Veterinary and Animal Sciences University, Chennai to The Hindu. “The fertilizer value of one tonne of dried cage poultry manure is equivalent to 100 kg urea, 150kg super phosphate, 50kg potash, 125kg calcium carbonate, 30 kg sulphur, 12 kg sodium chloride, 10kg magnesium sulphate, 5kg ferrous sulphate, 1kg manganese sulphate, zinc sulphate and other trace minerals each and is available at a cheaper rate than other market available inputs,” explains Prof. Narahari. A weekend farmer I came across a biotech plant growth regulator, Magic Gro, and used the same while planting the sapling and later as a foliar spray. A year later I have found that my plants are much healthier compared to my neighbour’s who planted the saplings almost at the same time. Intrigued, I quizzed Dr Ganesh Kamath of Organica Biotech (www.organicabiotech.com) on Magic Gro which facilitates availability of essential ingredients e.g. vitamins, amino acids, plant growth hormones, micro nutrients, plant stress relievers and essential microbes to improve over all plant conditions. In what way do biotech products, like yours help in enriching a plant? Chemical-based plant growth promoters are all-pervasive. How are they different from the biotech products? A chemical based plant growth promoter normally works on one single aspect of the plant cycle, whereas a biotech product will work on the total plant system helping it to achieve same or even better results as compared to a chemical plant growth promoter minus the side effects on the soil or the overall plant growth system. Are biotech products necessary for fruit giving plants, crops etc? If yes, why? Yes, in fact biotech products are very important for a fruit giving plants and crops. Previously a farmer’s concentration would always be around achieving higher yield of their final produce but in recent times more and more farmers are looking to improve their quality of the final produce. Today the farmer knows that having good yield is not enough but also having high quality of their final produce with lower chemical residues is important too. In today’s time having a high quality produce with a longer shelf life ensures them better compensation. A good biotech product plays a very important role in achieving and maintaining the quality of the fruiting plants and crops. Are farmers aware of the benefits of biotech products? The new breed of farmers are slowly getting aware of the benefits of an effective biotech product. But in reality much more has to be done in terms of educating the farmers about the benefits, especially the illiterate farmers. There is also a problem of several “snake oil” type of products which are sub-standard and low on functionality which are being sold in the market that make the job of education more difficult. Is cost, between chemical and biotech products, a deterring fact for farmers to switch over? Most farmers calculate the cost of a product by the price per bottle/pack. But it is very important the farmers start calculating the cost of a product in terms of number of applications and the area covered per application. For eg. 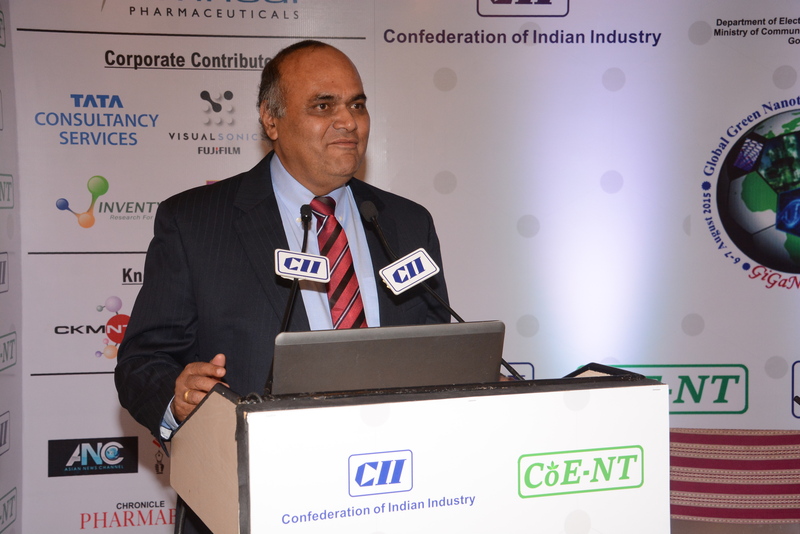 price of an effective biotech product could be Rs. 500 per pack while the price of a chemical PGR could be Rs. 200 per bottle. In the first case you need to use only two packs per crop cycle i.e. Rs. 1000 in total whereas in the latter case you are required to use ten bottles for the same area per crop cycle ie. Rs. 2000 in total. There are other benefits of using biotech products viz. less chemical residue in soil, lesser pest attacks, safer for the consumers etc. Biotech growth promoters like Magic Gro have been around since how long? Who are the other players besides you in the Indian market? Biological growth promoters have been here since last four decades. Many agriculture universities used to provide the microbial culture like Nitrogen Fixing Bacteria and later Phosphate Solubilizing Bacteria and Rhizobium in small plastic packs to the farmers. The problem was that the results of such applications were highly variable. Even today, some of the microbial culture products give favourable results only when the environmental conditions are specific. Scientists have discovered many more natural, safe and powerful organisms which can perform exceedingly well in terms of overall plant growth. The market is flooded with many biotech products, but sadly over 95% of them are low on functionality. People fail to understand that coming out with a biotech product is not easy and requires a lot of R&D strength. Vermicompost or biotech products. How are they different? It is like comparing apples to oranges. Vermicompost is a fertilizer which is organic in nature whereas a biotech product is not a fertilizer. People try to confuse the market; just because vermicompost or any other compost has some organism does not mean it is a biotech product. But when you mix a specific high functionality biotech product in vermicompost then yes, it can be called a “biotech grade vermicompost”. Vermicompost can be used to replace or reduce chemical fertilizers. Tell us more about Magic Gro users in India and elsewhere. We have users located in different climatic and environmental conditions in India and abroad. Many grape growers in and around Sangli are using our product for their vineyards. The average cost for treating an acre of a vineyard with our biotech product is around Rs. 2800 per season and the average extra profits which the farmer gets are to the tune of Rs. 30,000. Many potato growers are using our biotech product for blight problems. The average yield goes up by 28%. The sugarcane farmers can recover the cost of our biotech product within the first one month of seed sowing. The sugarcane seeds are dipped in our product solution and then sowed which helps in complete and faster germination. Average yield goes up by 10 to 40 tons per acre. Onion growers use our product for a very distinct advantage which is longer shelf life of the final produce and the complex aroma of the onion which is missing nowadays.